You have probably seen the pictures of unborn babies which have been doing the rounds on social media, and we've all seen this picture in our doctors surgery and antenatal clinic. I can't help but feel annoyed by seeing these images. The research was undertaken by Lancaster and Durham universities and has been published in a medical journal and featured 80 ultrasounds from 20 pregnancies between 24 and 36 weeks. The findings clearly showed the babies of smoking mothers covering their faces and appearing to grimace. The babies of non smokers appeared more relaxed. The lead author Dr. Nadja Reissland confirmed that nictoine exposure does impact the development of foetuses. This explains why the foetuses of smoking mums cover their faces more, a trait associated with a younger gestation and also that those babies were more stressed. Now I'm not a smoker, and so I don't want to preach. I've had friends who have become smokers and become pregnant and have struggled to pack in the ciggies, one of whom was advised by her GP to gradually cut back rather than stop all of a sudden. I appreciate smoking is an addiction, and a lifestyle, and so it mustn't be easy to give up, but really it's for the sake of your baby. Give them the best chance to thrive. Could e-cigs be just as bad, we don't yet know the effects of e-cigs and vaping. I like a glass of wine or a nice spiced rum and coke, but since finding out I am pregnant I have barely had a sip, as after everything we have been through, I want to give this baby the very best chance. Apparently our bodies are programmed to go off alcohol in pregnancy, clever hey. I must admit I'm not really that fussed about not drinking. I had a sip of Mr J's red wine while we were out for dinner last week, and it tasted vile. When I was pregnant with Oliver I did everything by the book. I'd already cut down on drinking before conceiving and as soon as I found out I was pregnant I stopped drinking. I took my Pregnacare every morning without fail. I stopped having hot baths, resisted coffee and tea (which made me gag by that point anyway), made sure I ate plenty of fruit and veg, gave up my beloved banned cheeses, and yet I went into premature labour. It was really hard not to be angry when our little boy was in intensive care and I'd see pregnant mums standing outside the maternity department doors in their dressing gowns shamelessly smoking away. I'm sure they went on to have perfectly healthy babies, and I often questioned: why me? 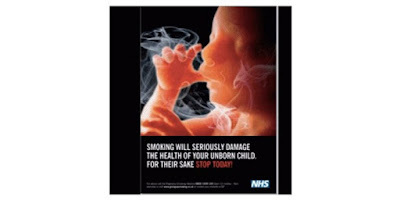 Hopefully these images will help hammer home the impact of smoking during pregnancy. We'd love to hear your thoughts on this, so share your comments!